-- Select a Size/Color -- Size 8 Size 10 Size 12 - Out of Stock! Size 14 Size 16 Size 18 Size 20 - Out of Stock! Size 22 Size 24 - Out of Stock! Size 26 - Out of Stock! Size 28 - Out of Stock! Prepare your dog for serious snow conditions with the Muttluks Reversible Dog Snowsuit. Enjoy two coats in one with reversible style! Open area for personal needs. Features 3M Scotchlite reflective material at neck for better visibility at night. Extreme conditions call for extreme gear! 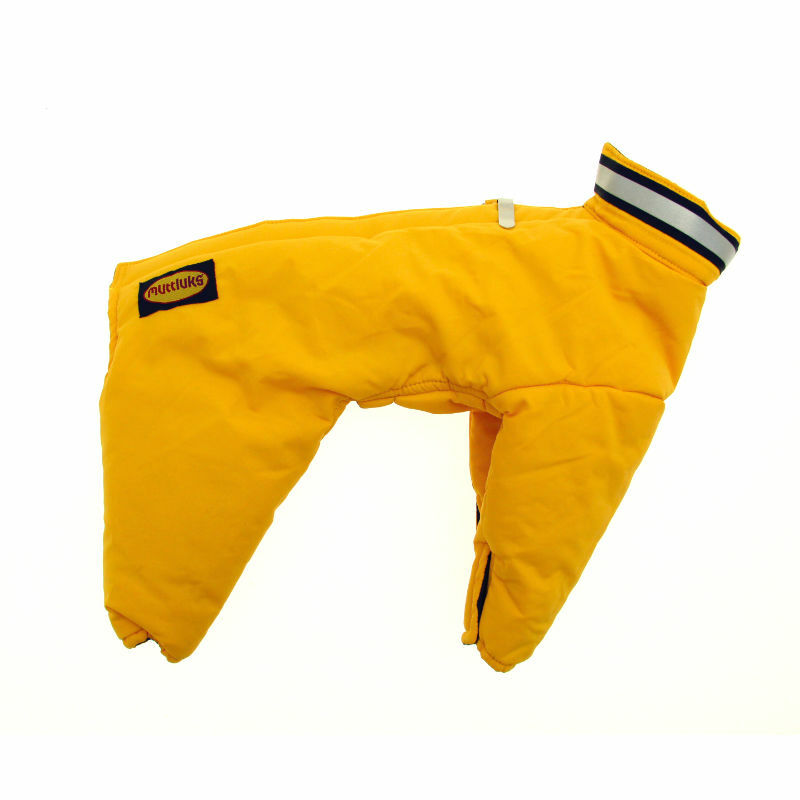 This Yellow and Black Reversible Dog Snowsuit by Muttluks is designed for dogs to keep them warm and comfortable in severe cold weather conditions. Those pesky and snowballs that accumulate on dogs with longer or curly fur aren't just annoying... they can be painful. Thanks to this well-made snowsuit, those icy clumps will be a thing of the past! Short-haired dogs also need protection from the elements. 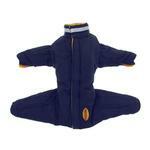 Their fur is usually the thinnest on the legs and abdomen, so a dog snowsuit is the best solution for them. This dog snowsuit is made in Canada (where they know a thing or two about winter) and they designed this with quality nylon reversible fabric with a polyester core for the ultimate protection. They've also included 3M Scotchlite reflective material at the neck for better visibility in low-light conditions. A metal clip helps to line up the heavy-duty touch fastener that runs along your dog's spine. The legs can be cuffed to accommodate dogs with shorter stature. Discreet openings allow for your dog to take care of their personal needs without sacrificing warmth. Also available in reversible Red/Navy. Due to the nature of this full body snowsuit, it is imperative to take your dog's measurements. The chest measurement is the most important. Please allow 2" extra for fur and movement as the measurements listed below are the actual sizes of the suit, not your pet. For more sizing tips, please see our product closeup video above. 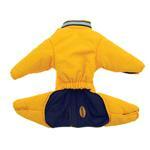 Muttluks Reversible Dog Snowsuit - Yellow / Black Customer Photos - Send us your photo! My Bichon Riley is 3 years old and love the snow. With this suit he can run, and roll as often as he likes, with NO frozen snow bunnies!!!. We love, its warm, breathable and he has plenty of room!!! Getting ready for the snow to start falling - temperature dropping but my medical alert "kid" Zorro is ready in his insulated parka! Wally is a two year old, 48 pound Labradoodle who loves the snow. Last weekend we had a blizzard and he was out with his legs wrapped in newspaper plastic bags. Wish we had this suit then. He doesn't look crazy about it now but I am sure he will be happy not to have to be combed out and blown dry every couple of hours next time. Natty is a 1 year old mini goldendoodle that LOVES the snow! She doesn't love coming insides full of snow/ice balls though so this suit has been a savior! Very easy to get on/off and super water proof. She easily runs in it as well. Finn is almost two years old and LOVES playing outside, even in our subzero temps (up to -50) here in the extremely remote, far, northwestern Alaskan village of Kotzebue! Thank you for selling such a high-quality snowsuit! Ruby is a 32 lbs, 10 month old Labradoodle in Colorado that loves the snow. Rudiger absolutely loves his new snow suit!! I'm sure Quincy will be more thrilled about his new snowsuit after the harsh Chicago winter sets in. He's sporting a layer look. At 17 lbs he's wearing SIZE Medium over his Gooby fleece hoody from last winter. Cornelius is our happy, high-energy baby. He loves to play and loves the snow! The Muttluks snowsuit allows just that! He stays warm, dry, and clean! A great product for our little love to stay healthy and happy during the winter. this suit is wonderful thanks! Here is Teddy in his new BaxterBoo snowsuit. When he goes out into a snowstorm he comes in with snowballs stuck all over him. Hopefully this will help. It is quite heavy so he is practicing walking in his snowsuit. Here he is resting up from his last attempt. Sal is a rescue & we couldn't love him more!! We've had hime since he was 6mo. and he is now 16mo. He is a standard "Parti Poodle" who is a bundle of fun and full of affection! CeeCee is hairless and needs good protection to go out in the snow! This is Skyler in the Minneapolis snow at Christmas. We live in Atlanta, so our dogs aren't used to snow but they loved it and loved the snowsuits. Posted On 01/26/18 by Robin W from Saint Charles , MO Yes, Robin W recommends this product! Love the suit for our boxer. Warm material that keeps him warm and protects him from the elements. Posted On 03/15/17 by Cindy S from Racine, WI Yes, Cindy S recommends this product! We just got 17 inches of snow. Between Tuesday and Wednesday. After washing it and line drying it yesterday. We practiced putting it on along with her black hiking boots. She really walked like I had sprayed it with a starch stiffener. She was really funny to watch. My husband and I just could not stop laughing. She eventually picked up her pace. After a little breaking it in, she even managed to jump up on to her favorite place up on our couch. Outside today in our newly fallen snow she was running. I placed her on top of a hill of snow and she was a was able to figure out her way down. After being outside for approximately 45 minutes we came inside. I noticed how warm her body was while taking it off of her. So it's definitely is made to keep you little one warm. She is proof of that. She will get a lot of use from this duet the rest of winter since she is all about being outdoors. Easy on easy off. Boots also easy on easy off. Posted On 02/22/17 by Tyson C from Brooklyn, NY Yes, Tyson C recommends this product! The length is perfect, but I can't close the velcro because the jacket is not wide enough. The material feels like it will keep your pet warm. Posted On 12/22/16 by tracy b from East Pittsburgh, PA Yes, tracy b recommends this product! Posted On 12/09/16 by Lee from ny, NY Yes, Lee recommends this product! Posted On 11/16/16 by salsa s from Warren, PA Yes, salsa s recommends this product! I love this stuff it is very high quality, I just need to change the right size for him. I will recommend to my family and friends. Posted On 01/31/16 by Margaret S from Wilmington, DE Yes, Margaret S recommends this product! Haven't had to use it yet but it is a roomy fit and is made well. Covers his whole leg which is what I was concerned about. Posted On 01/20/16 by Gerlin D from New york, NY Yes, Gerlin D recommends this product! Posted On 01/18/16 by sharon R from , MI Yes, sharon R recommends this product! This was well made and would have been wonderful if it had fit. My dog was just too large. Posted On 01/17/16 by sharon R from Upper, MI Yes, sharon R recommends this product! Loved it but it did not fit my dog. The largest size was too small :(. To make a very long story short...I purchased two of these in size 18 one yellow and one red for two little rescues that needed something warm for snow play. Upon arrival to our disappointment the suits were way to small, a good two inch gap along the back. The size 18 should have fit according to the measurement chart (dog measurements below). I called for some help and provided the measurements and a size 20 was recommended. The 20's were way to big. There was so much fluff and fabric between the front legs the dogs could barely walk. The chest piece hung down 4 inches making a nice scoop for the snow to get into the suit. The length of both the back and legs was ridiculous. The quality of these suits is fabulous which is the only reason I'm giving two stars. I'm so disappointed. Customer service was fantastic and refunds were issued extremely fast. Shoulder to tail - 18" Chest - 23" Neck - 16" second dogs measurements are the same except his neck is 16 1/2"
Posted On 04/04/15 by ELIZABETH B from Rochester, MN Yes, ELIZABETH B recommends this product! I ordered the snowsuit for my 17.5 pound poodle, because we walk in subzero temperatures all winter in southern Minnesota. I have used a Muttluks brand fleece lined boots since we got him in 2009. I have been nothing but pleased with the quality of the boots so I decided to purchase a snowsuit for him, because the one I purchased was back in 2009, and he needs a replacement. Because his legs are so long I like the fact that the snowsuit is long enough that it comes down to the bottom of his legs in the front and almost to the bottom of his back legs too. I think this will keep him warm much better than the one he has and in 10 to 20 degree below zero F weather. According to his measurements and customer service, I should have ordered him a size 14, but had read some reviews saying that they ran small so I ordered a 16. The size 16 ended up being too small, so I reordered an 18 and just received it today and it fits perfectly. I ordered it on Thursday and received it on Saturday. Posted On 03/18/15 by Ina K from , NY Yes, Ina K recommends this product! I have a lot of winter all weather suits for my Yorkiepoo, but this is the best! If your dog is 13" and weighs about 10 pds. This will be a perfect fit. Winter, has been extra harsh up north, but no worries with this suit. Worth it's weight in gold! Made excellent for cold, rain and wind! Posted On 03/18/15 by Tracy T from NYC, NY Yes, Tracy T recommends this product! Totally 5 stars....not sure I've ever seen my guy look so adorable. The size 24 fits my pup perfectly (he is 28in waist, 19in neck, and 20in long). He is lanky for his breed with legs slightly longer than average. The back legs are almost too long for him, so if ordering the larger sizes, I'd say this snowsuit would be ok as long as your dog doesn't have stumpy legs. But oh my goodness, this thing is CUTE!!! Posted On 02/09/15 by leeanna g from chicago, IL Yes, leeanna g recommends this product! Posted On 01/16/15 by Brianna K from , CT Yes, Brianna K recommends this product! This could not have fit my Hairless Chinese Crested any better. The size 16 was perfect. He wears pajamas all winter long so he is used to wearing clothes on his back legs. Because this suit is bulkier, he walks a little funny but he will get used to it. When I took the suit off of him for the first time, I could feel the heat on the inside of the jacket. It was incredible. I am beyond satisfied with this product and would highly recommend it. If your dog has short little legs, this suit may not be the best as the legs were too long for my Chihuahua (size 10) and Brussels Griffon/Chihuahua mix (size 14). You can roll the sleeves but I would say 2x max before it's far beyond bulkie. Posted On 01/14/15 by Brianna K from , CT Yes, Brianna K recommends this product! I absolutely love this suit. My dog is not used to wearing anything with back legs, so it will take some time to get used to. The quality is great. I just wish the legs were a tighter fit and a little shorter- they are quite long for my little guy but we will make an adjustment. Thw snowsuit is very well made and I love that it is reversible. It's important to measure your dog carefully as I had to return for a larger size. The suit is a bit rigid so my pups walk around like they are in an armored suit. I'm hoping that once they get out in the snow they will relax and be more comfortable. The suits are a hassle to put on though and getting little legs and paws thru the arms takes patience. This difficulty will probably limit how often I use them. Sweaters and coats remain the easiest for a quick walk. Posted On 12/06/14 by Joan E from Havana, IL Yes, Joan E recommends this product! LOVE IT !!! Best made, worth the money. But I ordered the size 16 because my dog is 16" from neck to start of tail and measured the out side of coat and it would of been very tight. Maybe they run smallish. But my dog has a lot of hair under her(Scottie) so I will return and order the next size. Girth when snug up a tape measure was 22". Coat says good for 24"? Length was good. Anyway it was just what I was looking for. Super Great.!!!! Posted On 12/06/14 by Carol T from , NH Yes, Carol T recommends this product! I am returning this item. I ordered a size 10 for my 8-lb Yorkie but it was too tight around the chest area. I guess I did not allow extra for his hair. I will be ordering a size larger. It appears to be of superior quality. Posted On 12/01/14 by Leigh K from Boston, MA Yes, Leigh K recommends this product! These snowsuits are the best - couldn't be better!! Ordered size 16 for both my minis but found ran smaller than the rainsuits. Rainsuits are wonderful in size 16 and KNOW these snowsuits one size up (to give extra room) will be just what my minis need to now have their fun in the snow!! No more snowballs on their furnishings - will come in nice and warm!! Posted On 11/20/14 by Jacqueline A C from West Palm Beach, FL Yes, Jacqueline A C recommends this product! We are anticipating a move to Virginia or Lake Tahoe in a few weeks. Willow's born and raised in Florida and has no undercoat, so a snowsuit is a must. Couldn't have picked a better one. Just as well made and toasty as any kid could wish for. Thanks Baxter Boo. Posted On 11/17/14 by Mary C from New York, NY Yes, Mary C recommends this product! a wonderful coat but I'm returning for larger size. A bit of a challenge putting it on but once on its great. Well made and I love that it's reversible. I have two toy poodles and bought one for each of them. Can't wait until the new sizes arrive. Posted On 10/21/14 by denise p from staten island, NY Yes, denise p recommends this product! I was extremely pleased with the quality of the products and the speedy delivery!